Borosilicate glass mainly consists of silica and boron oxide. Borosilicate glass is known for being less dense than ordinary glass and for having very low coefficients of thermal expansion, making it resistant to thermal shock, more so than any other common glass. Borosilicate glass was first developed by German glass-maker Otto Schott in the late 19th century and sold under the brand name "Duran" in 1893. After Corning Glass conducted a major revamp of their operations and introduced Pyrex in 1915, it became a synonym for borosilicate glass in the English-speaking world. Most borosilicate glass is colorless. Colored borosilicate came form the studio glass trade and was first widely brought into the market in 1986. Colors in the glass that you see come from mixing metals like 24k gold, silver, copper and other elements with the glass. During the mid-twentieth century, borosilicate glass tubing was used to pipe coolants through high power vacuum tube–based electronic equipment, such as commercial broadcast transmitters. Glass cookware is another common use. 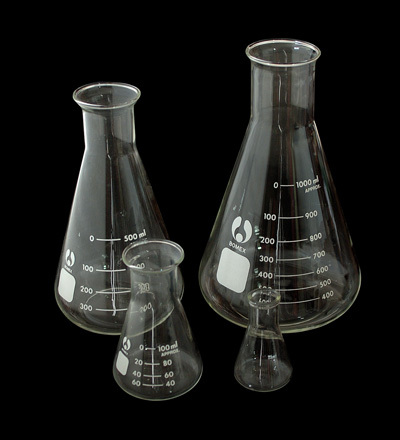 Borosilicate glass is used for making measuring cups that have screen printed markings which provides graduated measurements they are widely used in American kitchens. Borosilicate glasses also find application in the semiconductor industry in the development of micro electromechanical systems (MEMS), as part of stacks of etched silica wafers bonded to the etched borosilicate glass. The thermal insulation tiles on the Space Shuttle are coated with a borosilicate glass. Many high-quality flashlights use borosilicate glass for the lens. This allows for a higher percentage of light transmittance through the lens compared to plastics and lower-quality glass. New lampworking techniques led to artistic applications such as contemporary glass marbles. The modern studio glass movement has responded to color. "The availability of colors began to increase when companies introduced the Crayon Colors, which brought a whole new vivacity to the glass industry." Borosilicate is commonly used in the glass blowing form of lampworking and the artists create products ranging from jewelry, kitchenware, sculptures as well as artistic glass lighting. Borosilicate glass is sometimes used for high-quality beverage glassware. Borosilicate glass lends kitchen- and glassware increased durability along with microwave and dishwasher compatibility. Most astronomical reflecting telescope glass mirror components are made of borosilicate glass because of its low coefficient of expansion with heat. This makes very precise optical surfaces possible that change very little with temperature, and matched glass mirror components that "track" across temperature changes and retain the optical system's characteristics. Eyeglass lenses are some time made with borosilicate glass. Borosilicate is also a material of choice for evacuated tube solar thermal technology, because of its high strength and heat resistance. Additionally, borosilicate tubing is used as the feedstock for the production of parenteral drug packaging, such as vials and pre-filled syringes, and is also used for the production of ampoules and dental cartridges. The chemical resistance of borosilicate glass minimizes the migration of sodium ions from the glass matrix thus making it well suited for injectable drug applications. This type of glass is typically referred to as USP / EP JP Type I.
Borosilicate glasses are used for immobilisation and disposal of radioactive wastes. In most countries high-level radioactive waste has been incorporated into alkali borosilicate or phosphate vitreous waste forms for many years and vitrification is an established technology. Vitrification is a particularly attractive immobilization route because of the high chemical durability of the vitrified glass product. This characteristic has been used by industry for centuries. The chemical resistance of glass can allow it to remain in a corrosive environment for many thousands and even millions of years. Copyright © 2012 Dreams of Glass.com All Rights Reserved.